Abdicating your company’s data protection responsibilities to the first cloud solution provider you encounter is just as unwise as doing nothing at all to leverage the cloud. On the other hand, it can be a wise decision to investigate what results you might achieve by choosing a backup technology that is capable of supporting a hybrid protection approach capable of covering both on-premises technology and offsite cloud capabilities. Many organizations will still use tape for long-term data preservation and portability, but “disk to disk to cloud” is likely in their future — secondary protection disk for agile recovery, and tertiary cloud services providing off-site survivability and boosting BC/DR preparedness. However, it is important to note that the cloud is not magic. The true value of a hybrid architecture lies in its agility and in its appealing economic model, which comes from harnessing cloud services and impressive software together. 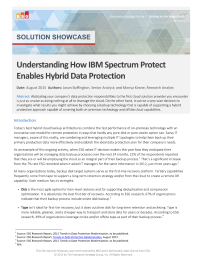 Download this paper to learn how IBM Spectrum Protect enables hybrid data protection through new data protection architectures, including highly available virtualized and hybrid backup environments.